Registration is coming! Registration is coming! As first year registration creeps closer and closer, it’s time to start thinking about CDI101, a first year student must-take here at Bentley University. CDI101 is a half-semester course where students learn how to do a professional resume, cover letter, create a LinkedIn, and much more from our #1 ranked Undergraduate Career Services department and Career Coaches. First year students can choose to take it either first half of the semester or second half of the semester. To look at the available days and times for this course, check out Bentley University Course Listings. Note: Have backup options! Space is limited, and like any must-take course, you need to have backup sections in case your first choice fills up. 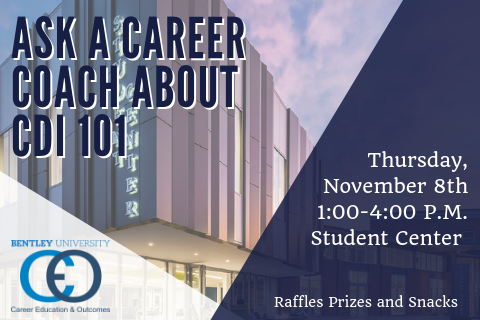 Stop by the Career Services table on Thursday, November 8th from 1-4PM outside Seasons to learn more about the class and to answer any career-related questions you might have!